52 Weeks of Historical How-To’s, Week 26: Brewing Scurvy Grass Ale! And two ales more, or else I needs must lie. We had a sort of ale, called scurvy ale. 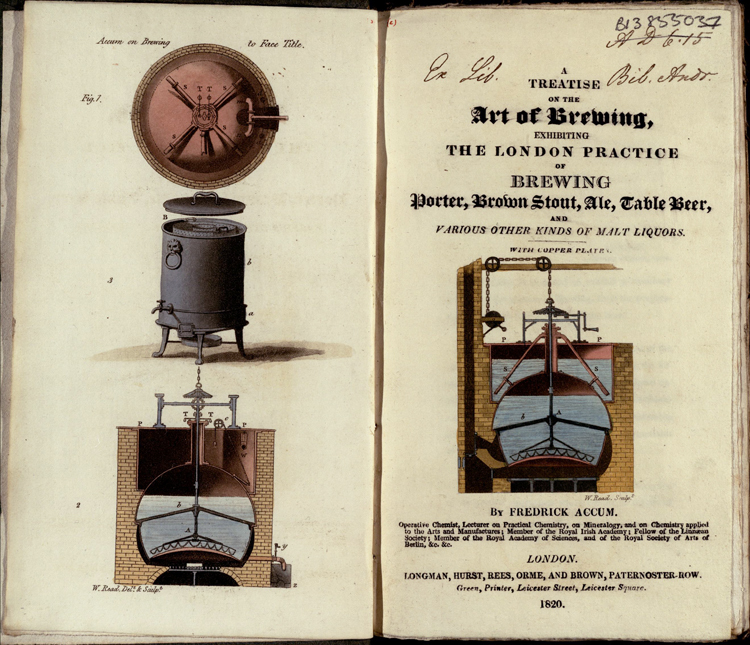 Several 19th century treatises on beer and brewing from our Copyright Deposit Collection. This week’s How-to post gave an excuse for our two departmental home-brewers, Marc and Daryl, to stretch their boundaries to adapt a strange recipe for “Scurvy-grass Ale” found in an early 19th century book from our collections. St Andrews has a number of tracts from the London brewing trade from the 19th century, as well as other earlier works on cultivating hops and wine. Unfortunately, almost all of the 19th century tracts in our collections are largely treatises on how to keep a brewery, how to measure specific gravity (or alcohol content) of various beverages or the taxation schedules of various drinks. Colour frontispiece and title page from Friedrich Accum’s A treatise on the art of brewing, which unfortunately doesn’t include one recipe!